Navratra fasts observe a distance from wheat flour. As alternatives, kuttu, sabudana, rajgira and other non-wheat based flours are consumed with simple potato based curry or dry vegetable. Onions, garlic, pulses and rice are especially not eaten during these nine days. 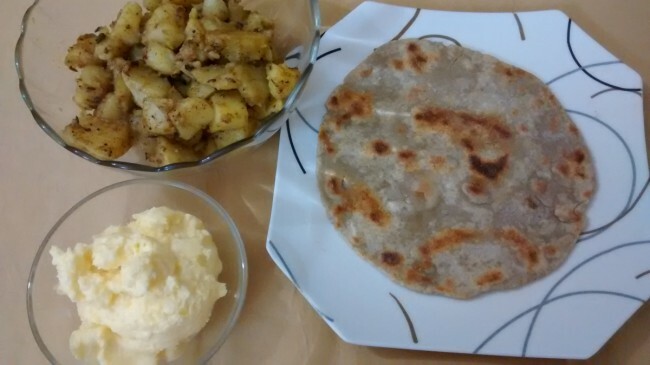 This is an easy recipe to make Kuttu Chapatti with a simple Potato Masala accompaniment, served with homemade butter to complete the meal. Prepare the potato masala first. Place a clean wok or deep frying pan over medium heat and pour oil in it. As soon as the oil heats up throw in the cumin seeds and let them crackle. Then add the green chilies. Stir-fry for a few seconds and then add the rock salt and coriander powder. Stir. Now add the potato pieces and toss to coat with the spices nicely. Finally add the chopped coriander and stir again. Turn off the heat. For the kuttu dough, combine the kuttu flour, shredded potato, green chilly and rock salt using clean hands to knead dough. Add a little water if required. Tip: The dough should not be too soft otherwise it will break while rolling. Sprinkle a little dry kuttu flour on a clean rolling board. Break off a portion of the kuttu dough and roll it within greased palms and then into a chapatti with a clean rolling pin. Place a flat non-stick pan or griddle (tava) on medium heat and once it heats up place the kuttu chapatti over it. Let it cook slightly from one end and then flip it over. After a few seconds on the other end again flip it back and apply some cooking oil or ghee on it. Then flip it and press gently. Repeat with the other surface. Tip: You basically need to cook it like a parantha but with less oil or ghee. It soaks up the oil or ghee and doesn’t appear greasy like a parantha; that’s why it is called a kuttu chapatti. When done, transfer to a serving plate and serve hot with potato masala and homemade butter (if desired).